Are you looking to start or grow a business? 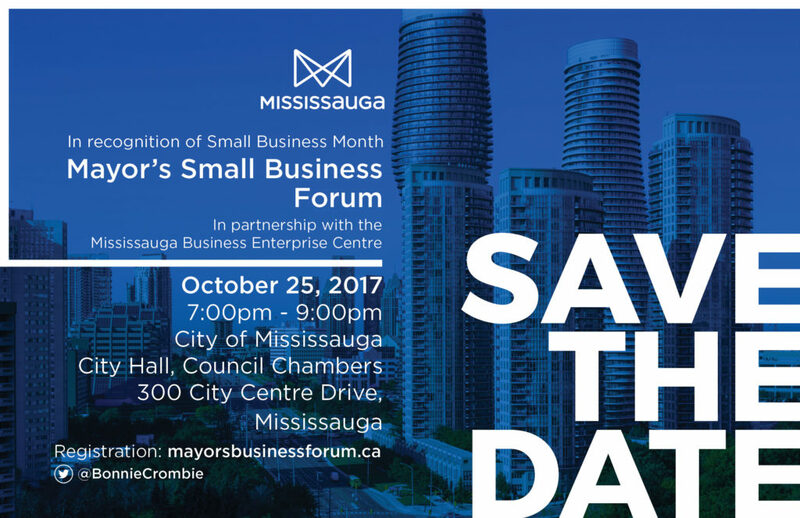 In celebration of Small Business Month, we invite you to join us tomorrow – October 25, 2017 from 7-9PM at Mississauga City Hall for our Mayor’s Small Business Forum, hosted in partnership with the Mississauga Business Enterprise Centre (MBEC). You will have the opportunity to learn about local programs and services available to support your small business owner. We are excited to highlight that a key component of the event will feature a panel of business and government representatives speak about the programs and services available to support our local small business community, followed by a question and answer period. Enjoy a time of networking and refreshments following the presentations in the lobby area, where you will also have a chance to learn about other programs and services provided by some additional local organizations, including the Business Development Centre (BDC) and the Mississauga Central Library. Please RSVP your attendance to www.mayorsbusinessforum.ca. If you have questions or inquiries, please contact mbec@mississauga.ca or 905-615-4460. This entry was posted in Carousel News, Innovation & Entrepreneurship Taskforce, News, The Crombie Column. Bookmark the permalink.